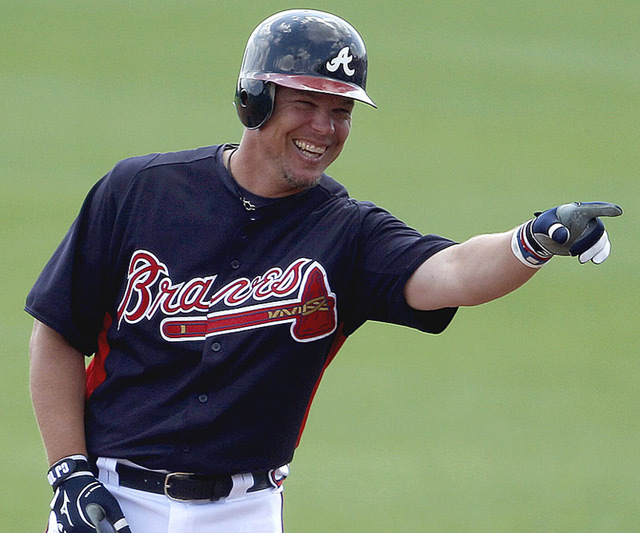 Braves 19-year veteran Chipper Jones is having a hot start to his final season in the big leagues. LIVINGSTONE: It was unclear after the last couple seasons if Chipper Jones would ever return to a hitter remotely as good as he was in the prime of his 19-year career. Plagued by injuries and surgeries to repair his beaten up knees, Jones hasn’t hit near .300 since 2008 when he hit .364 (in 2007 he hit .337). From 2009 to 2011, he hit well below his career average and his numbers dipped across the board, particularly in 2010 when he hit 10 HR and drove in 46 in 95 games while hitting below .250, 57 points under his carer average of .307. The last week of baseball involving Jones has been a return to the years when the solid third baseman was hitting well above .300 and driving the ball out of the park on a regular basis – all while coming through in the clutch. 9-for-21, 2 HR, 9 RBI, 7 Runs and a sizzling .429 average. While it’s only over seven days, it sets his season stats at .318, 5 HR, 21 RBI, 7 K, 2 2B, .946 OPS in only 18 games. While many of his hits account for singles, he’s putting up solid numbers for a guy approaching 40 years of age. Jones had an incredible two games where he hit the game-winning two-run home run against the Phillies in a wild extra-innings game that ended up 15-13 in favour of Hot’lanta. Jones then put up five runs for the Braves in a 13-9 clobbering of the Rockies at Coors Field (note: Atlanta scored a total of 34 runs in the three-game sweep of the Rockies over the weekend). He’s playing great baseball right now and knowing this is going to be his last season as a member of the Braves, it’s exciting to watch a first-ballot hall of famer put up such an impressive curtain call season. Yes, first ballot. He’s amassed more than 2,600 hits in his career, over 450 HR and is nearing 1,600 RBI. His career OBP (.402) and OPS (.935) are hall worthy – and his run of finishing in the top 11 of the MVP race from 1995-2002 is indicative of his talent and foundational role in the Braves line up (he won the MVP in 1999 with a 45 HR-110 RBI-.319 AVG). Let’s hope Jones can continue the hot start to his season through to September and maybe even into October. One last kick at the World Series championship would end one remarkable career on the highest of notes.